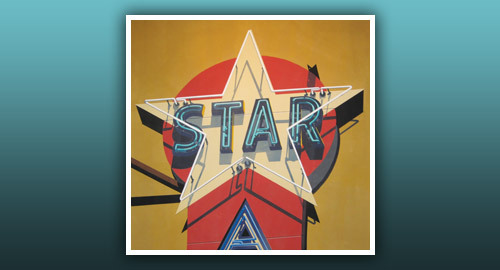 Brooklyn-born Robert Cottingham gained acclaim as a great photorealist painter of America’s signs and building facades. Throughout the 1970s and ‘80s, Cottingham was fascinated with the image of a star on billboard marquees and electrified commercial signs. He was inspired to incorporate the star with common letter forms and images in creative compositions to evoke the American spirit. Now through January 9, 2011, this nostalgic exhibition debuts a series of 20 iconic star silkscreens on canvas, based on color variations of one of his most familiar images. In this poignant exhibition, Cottingham sentimentally depicts the vanishing icons of American culture. His shimmering paintings feature the beloved symbols of our time with the bold imagery of stars to provide an intriguing look back at a simpler time. MDG Advertising handles all creative advertising, collateral design, transit advertising and media buying for this enriching, non-profit cultural institution in Boca Raton, Florida. Michael Del Gigante is president and executive creative director of MDG Advertising. MDG Advertising, a full-service Florida advertising agency, with offices in Boca Raton and New York, NY, specializes in developing targeted, Internet marketing solutions, exceptional creative executions and solid branding and media planning strategies that give clients a competitive advantage. To view all MDG corporate identity projects, collateral design, signage, TV and Web design, click here.